Mitzi Bytes, by Kerry Clare, has been received by reviewers as a light, farcical take on the blogging life, as well as a delightful reworking of the beloved children’s tale Harriet the Spy. With her first novel, Clare highlights the link between traditional storytelling and more contemporary technological modes such as blogging. Furthermore, she charmingly observes the connection between girlhood imagination and women’s inner lives. Her heroine is Sarah Lundy, a seemingly ordinary wife and mother in possession of a long-held secret. Sarah is the true identity of celebrity blogger Mitzi Bytes, infamous for the scathing observations of family and friends that have earned her a berth on the New York Times Best Sellers list. Naturally, she has been careful to change the names of the people she writes about. Unfortunately, this does not prevent one canny reader from figuring out the truth. The aggrieved individual- who remains nameless- is threatening to blow Sarah’s cover. 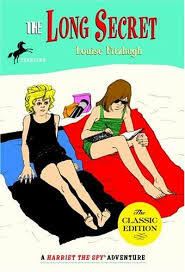 The novel is a clever adaptation of Louise Fitzhugh’s Harriet the Spy about a school girl who loses her friends after they discover what she has written about them in her notebooks. Clare even reproduces the hilarious iconic scene in which Harriet is caught hiding inside her neighbour’s dumbwaiter. In the adult version Sarah, who is snooping around her sister-in-law’s home, must squeeze into a dumbwaiter to avoid detection. Not surprisingly, adult spies turn out to be a whole lot creepier than child spies. Clare, author of the long-running blog Pickle Me This and editor at 49thShelf.com, did not read Harriet the Spy until she was well into her twenties. It was another Fitzhugh book that obsessed her as a child. “The Long Secret was the sequel to Harriet the Spy,” says Clare. “It was incredible. It was about the character Beth Ellen. I remember it meant a lot to me. Clare, who like Sarah, is the happily married mother of two girls, enjoys women’s fiction because “there is always so much going on and a lot of underlying humour.” In Mitzi Bytes we accompany Sarah as she delivers her daughter to school, amusingly attempting to evade the other “mother people.” Some days she grabs coffee with a dear, if annoying, friend. Back home, she might head upstairs to her office where she can “watch” neighbours through her picture window, write her blog and work on freelance assignments. In the evenings she reads to her children and enjoys alone time with her husband. Often they make love. Clare deftly shapes daily details into a seamless narrative that reflects Sarah’s complexity and the dimension of her days. She is working out a way of “writing a woman’s life,” to borrow a phrase from critic Carolyn Heilbrun. The novel takes up this theme. The women in Sarah’s book club, for instance, passionately read Virginia Woolf, an author whose experimental narratives were among the first to attempt to represent the fullness of female experience. As well, Sarah’s part-time job involves transcribing taped interviews of wives of World War Two veterans: “The extraordinary ordinary stories that only get peripheral treatment in the history books,” thinks Sarah. These women had raised their families in the neighbourhood, walking the same sidewalks, living in the same houses, dragging tired feet up and down these narrow staircases. And Sarah kept getting lost inside their stories, forgetting to type – caught up in the spaces between sentences, how words trailed off, the nuance and tone, all that stayed unsaid beneath the surface. Clare grew up in Peterborough, Ontario in the 1970s and 80s. The first thing she remembers writing was a poem for Remembrance Day in Grade 3. “Of course, it wasn’t very good,” she recalls, laughing. “But I remember it came together in a way I didn’t quite feel responsible for.” Nevertheless, from that day, her teacher, who was impressed, began to encourage her creativity. Clare’s parents were encouragingly open-minded. Her mother a trained nurse, transferred her skills to the classroom where she worked with high school students with special needs. Her father eventually established a business selling photocopiers. Motherhood is another of Clare’s seminal themes. She published a well-received anthology The M Word: Conversations about Motherhood (Goose Lane) in 2014. In Mitzi Bytes, Clare skilfully dramatizes the breathy staccato of children’s dialogue and conveys the sweet, damp weight of small, clinging limbs. She manages to communicate the almost physical intensity of the mother/child bond. In this respect, Clare recalls Rachel Cusk, particularly Cusk’s tragicomic collection Arlington Park. In those stories, well-educated women in a London neighbourhood arrive at the startling realization that their autonomy has been hijacked by motherhood and marriage. Even at her most droll, Cusk’s view of domesticity is much darker than Clare’s. That said, in Mitzi Bytes we come upon a number of horrific incidents involving children. News reports of babies drowned in bathtubs or abandoned in garages. Distinct references are made to the massacre at Sandy Hook Elementary School in Newtown, Connecticut in 2012. “Sending a child out into the world is a huge act of faith,” Clare admits. “Having a child is a huge act of faith. It’s a dangerous world,” she adds. Still, for Clare, Mitzi Bytes is “an ode to the overwhelming awesomeness of being someone’s mother.” And at the same time, a celebration of the happy marriage. Sarah and Chris, her husband, are deeply content, even though she somewhat resents his unwillingness to alter his work hours. The situation becomes a trade-off rather than a standoff, with Sarah accepting responsibility for the majority of the childcare as a fair (enough) exchange for financial comfort and a happy marriage. Incorporating the happy marriage is one more way Clare is attempting to challenge the popular narrative of contemporary women’s lives. Mitzi Bytes, like many a slightly, farcical tale, turns on the question of secret identities. It is anticipation of Sarah’s unmasking that keeps readers flipping pages. We also derive pleasure from the novel’s relationship to Harriet the Spy which evokes the boundless joy of our earliest literary encounters. Still, it is important to acknowledge Clare’s formal concerns: Narratives that allow for the multifariousness, psychological complexity and creative autonomy of artistic women. Clare’s experimental narratives make her a writer to watch.